Hoverboards have been in more trend now than ever. Kids love these rolling machines. You want to gift something to your child; hoverboard appears to be the best option to the surface. But the real challenge is finding the best hoverboards for kids because of the countless opportunities waiting for you online. There are so many different options available in the market that makes your selection process extremely tedious. They all vary in kind and types, quality, brands, prices, etc. Well, if you are worried about finding the right option for your child, then this review is going to help you immensely. My aim of writing this review is to help the parents select the highest-quality and useful machine that can pay them back every penny spent of their hard-earned money. So, I will start with some of the signature points to keep in mind while selecting the best hoverboard for kids. If you carefully store these tips in your account and apply them while choosing, you will surely bring home the most excellent machine. These are some of the essential tips that every parent should keep into account while selecting a hoverboard for their child. All the parents buying a hoverboard for their child should keep its maximum speed limit in mind while making a purchase. You certainly don’t want your child to be recklessly driving that can cause trouble for them or the people nearby. Speed is especially a concern while maneuvering the hoverboard. The product you select should have decent speed but not too much that a child is not able to control and handle. Make sure that the hoverboard doesn’t support speed more than 8 – 10 mph. Eight is considered to be suitable for all the kids. It’s manageable. However, if your child likes some thrill and adventure, then it can go up to 10 mph tops. How can someone pick anything for a child without ensuring their safety? There are specific safety measures that one should consider. The batteries of the hoverboard can quickly catch fire on overheating. Also, the hoverboard can also catch fire because of faulty batteries. However, companies are not making sure that accidents can be reduced to the minimum. 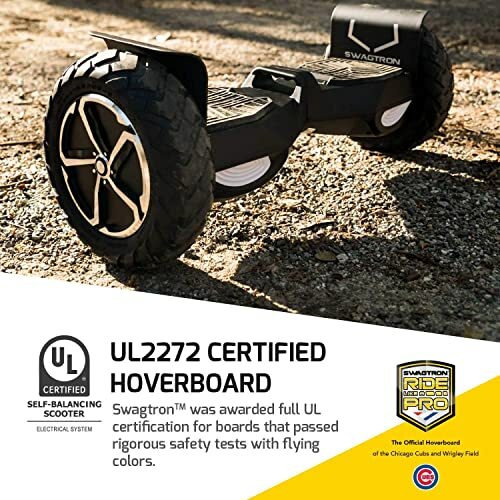 But while purchasing, make sure that hoverboard is UL 2272 certified. The recommendations that we will be creating below are UL certified. You can either make a direct purchase or keep this feature in mind. Hoverboards usually have two types of tires- plastic or rubber. The plastic ones are solid and do not possess any tubes. These tires are great for hard surfaces but not for the soft ones. They don’t perform as well there. Also, these tires are not as durable and long lasting. They can wear out soon. Rubber ones are durable tires. They are solid and performance-rich. They work great on all kind of surfaces. However, if you are going to drive a hoverboard on hard surfaces, then there is no alternative to plastic tires. These days, the hoverboards come with the training mode. 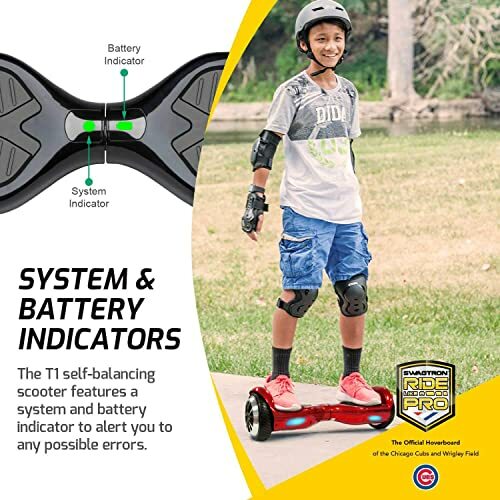 When your child is learning to use a hoverboard, this feature comes handy as it runs on a very slow speed by enabling the child to learn to balance. This feature is something that shouldn’t be neglected. You don’t want the hoverboard to break in the middle of the road or after the first drop. Make sure that the build quality is excellent. These days, there are plenty of brands manufacturing high-end hoverboards. You are highly suggested to research the retailer and see if he is trustworthy. You can do that by reading the comments and customer reviews. Kids know a hoverboard as a mean of entertainment. They might not get tired riding it. That is why it is your responsibility to find them a machine with excellent battery backup. Most products last not more than an hour. But this depends on mileage covered, time of usage, and speed. The weight of a hoverboard should be cautiously considered. While going out on a playdate, you cannot roll it on the road as you walk. These boards should be used on hard surfaces and not even on the steeper inclines. So, whenever your child has to carry them, make sure they do it conveniently. The prices in these machines vary greatly. You can sometimes get a product at a highly affordable cost which can still be trusted. The quality of these machines does not rise with the rising price. Just make sure that you believe the retailer or seller while buying it. Tomoloo is among the leading brands when it comes to hoverboards. This model has got various innovative features to entice buyers. UL2272 Certified for utmost safety of the child. 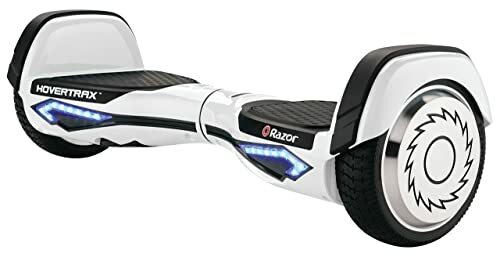 Get connected with Bluetooth 4.0 system for tracking the location of the hoverboard as well as for the entertainment purposes. Tomoloo hoverboard is a brilliant ride with futuristic features in it. All kind of safety measures is taken into consideration during construction. The shell of this machine is high-temperature resistant which means that there is no threat of hoverboard accidentally catching itself on fire. This is a self-balancing machine which is quite suitable for the new users. The highest speed is 8 mph which is suitable for all kind of riders. features of this model that will excite the buyers, the affordable price being one of them. Well, while looking for the best hoverboards, it is impossible to look past this model from Razor. Other than the stunning looks, it is flooded with great features. The run time of 60 minutes which is sufficient for the hobby riders. The LED light and battery power indicator to help you know about the time when you need to recharge. Two riding modes: Training & Normal Use. This model is great for the new users as well as the skilled ones. This machine has got all the decent features that one would look in their hoverboards. The classic specifications include the weight compatibility of 220 lbs, training mode for new learners, LED light, and so on. This machine is a complete value of money and available at a decent price. This is another model from Swagtron from the T range. T3 is a enhanced version with smart features that give more power and choices to the riders. The speed of 8 mph is great for balanced and controlled riding. You can easily give it to a beginner without any concern of them overspeeding on the road. Operated through a mobile application so that you can keep a look at the speed and other features in use. Mesmerizing looks that are popular among kids. 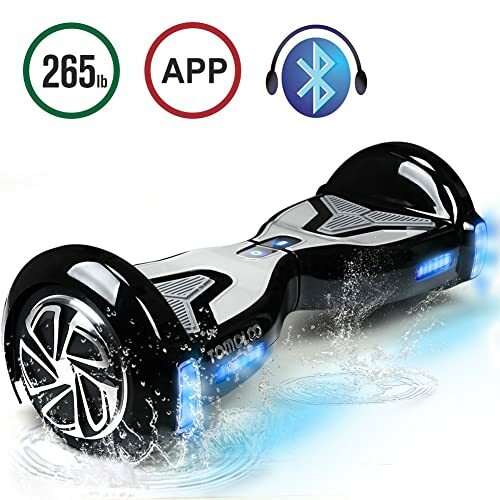 The hoverboard is available in beautiful colors and it has got signature designing of Swagtron. What I liked the most about this product is the features such as Bluetooth connectivity, operation through a mobile app, etc. The material is stain-resistant and comes with silicon coating. It is a decent machine overall. The EPIKGO hoverboard is made for the skilled riders. That is why the age mentioned by the manufacturer is 13 years. This machine comes with uncompromised quality. This one is also UL2272 Certified which means that the safety of your child is safeguarded by the brand. 400 Watts Dual Motor ensure that the machine operates seamlessly on all kind of terrains without any fail. This is among the most sophisticated machines in the market that is 2 times more powerful than its counterparts. The design and features are innovative. You kid will really enjoy the kind of speed and control this machine provides. I would recommend it to the experienced children as well as the newbies. 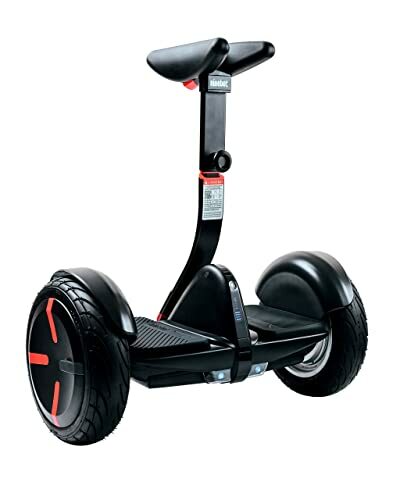 Well, whether it is about the looks or the performance of a hoverboard, it is difficult to go past the Swagtron T6. This machine is for experts. There are three different styles available in this model to give you versatility in selection. This can handle weight up to 420 lbs which is great for the kids of 13 – 14 age group. Since it is an expert range, you can expect it to incline up to 30 degrees so that you can travel easily from mud, gravel, and different surfaces. The feature of water-resistance will allow you to ride in the rain as well. It has 10 inches tubeless tires to ride you best on difficult routes. This is a self-balancing scooter for the beginners and experienced kids. The Bluetooth connectivity you to listen to music during a ride. The tires are the USP of this model as this is one of the best hoverboards with tubeless tires to give effortless riding experience. The Li-ion battery is great and can afford up to 12 miles of the continual ride. You just have to charge it for 2 – 3 hours and it is good to go. The material of the machine is dirt and splash-resistant. This brand OXA is an up and coming company that has created this marvelous hoverboard. If you are looking for an affordable machine then this one could make a great purchase. As far as the features are concerned, let’s take a look at them. The machine has got intelligent controls for carefully monitoring the changes. UL 2272 certified and comes with overheat protection, low weight protection, and over-speed protection. This one can give a maximum speed of 7.5 mph and 30 degrees slope. This kind of speed is good for beginners. Also, the parents will be confident that their kids are not riding too harsh. 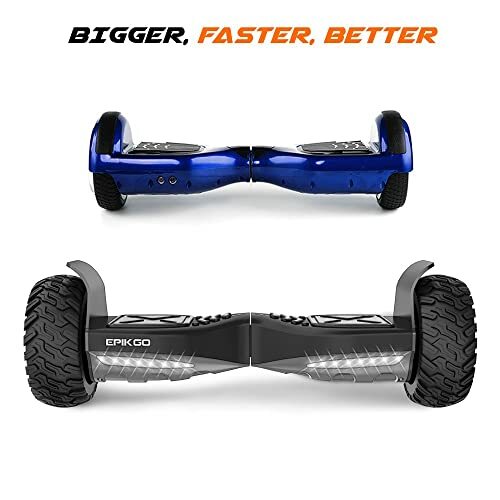 There are two different modes available in this hoverboard, non-self balance mode for the beginners and self-balance mode for the practiced kids. This machine is a great purchase. The features are amazing. The LED lights not just illuminate the route for the rider but also gives a signal to others on the road about the hoverboard. It is a stylish machine that your child will surely love. Because of a unique design, many people say that this is not a hoverboard. But if you see it closely, the design is the same only that it is made to help kids balance perfectly on the machine. This is an incredible product and quite popular among buyers. This model comes with a durable aircraft-grade magnesium alloy frame for long-lasting performance. The maximum speed given to this machine is 10 mph which is extremely suitable for an experienced rider. It gives more balancing to the child. The maximum weight that it can afford is 220 lbs. The machine in itself is quite lightweight and less in maintenance. It is suitable for kids above 12 and below 16 in age. The hoverboard should not be exposed to a temperature below 15 degrees F and above 120 degrees F.
This is an affordably priced machine with amazing overall features. The design is also unique and it is readily available for the new riders as well as experienced ones. Also, the alloy wheels are great for harsh and uneven terrains. While you search for a good brand, they will recommend their hoverboards for kids 8 years or above in age. I haven’t come across the brands that aim at the age below 8. However, if your child is younger and wants a hoverboard for his birthday, then you should look for something with 6.5 inches wheels. This will be comfortable for the younger age group. Because safety is a major concern, we recommend not to give your child a hoverboard before 8. Another essential thing to keep in mind is the speed of the board. For such kids, it shouldn’t be more than 8 mph. So, as I was saying, the right age to use a hoverboard starts at 8. At this point, you can have endless options to choose from. Since the child is getting a hoverboard for the first time, there are a couple of things that you should keep in mind. Firstly, make sure that the wheels are small in size. It will give a better balance to the board and so as the child. Also, make sure that the machine is not immensely fast or powerful because your child won’t be needing that. 10 mph speed is justifiable for kids in this age group. The kids in the age of 12 -13 are skilled and more practiced. At this point, you can get them something with more power and speed. For such an age group, the speed limit can go up to 20 mph. You can find products with features such as Bluetooth connectivity and speakers so that they can enjoy their favorite music while riding. If you have been following my review since the beginning then you know that I already mentioned UL 2272 certification above for the safety of the kids. Here, I will share with you some details on this certification. On passing these tests, the company provides UL certification to the products of that particular brand. 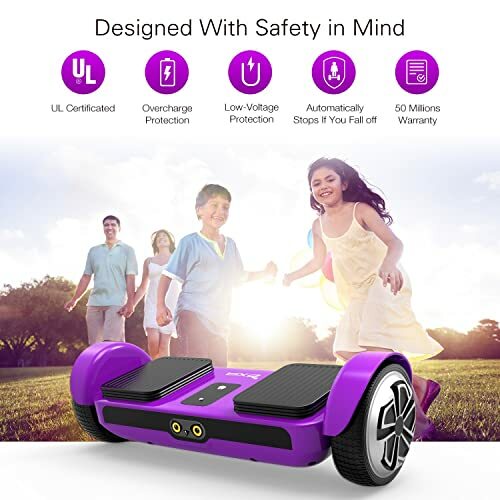 If you find a hoverboard UL certified then you can rest assured about the safety of your child. So, in this section, I would like to answer some of the common concerns of the parents that are planning to get a hoverboard for their child. What is the right age for kids to start riding a hoverboard? If we go by the manufacturers, a kid should not ride a hoverboard before turning 8. These machines run automatically and the child should be big enough to maintain balance. We would also recommend that unless you are absolutely sure, let your child turn 8 and then get them a hoverboard. How long does a hoverboard last in a single charge? Mostly, a hoverboard takes 2 – 3 hours for full charge. It can last for 60 minutes. This means that your child can ride for an hour, without stopping. This is a case with most of the hoverboards however, exceptions are always there. The main reason for a hoverboard catching fire is cheap battery material, overheating, and blasting. 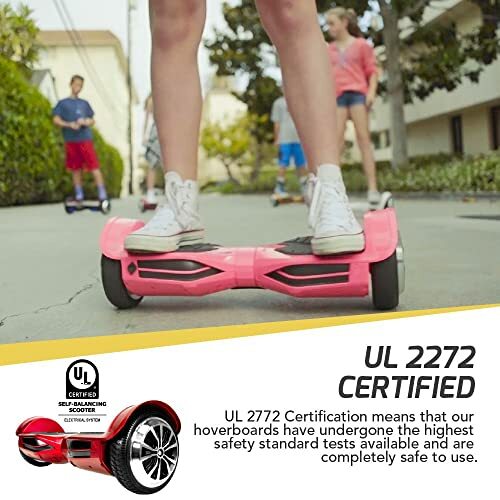 That is why you are always recommended to use a hoverboard with UL2272 certification. No, not all the hoverboards are waterproof. Moreover, they are not actually waterproof but mostly water-resistant. You are not recommended to ride them in rains. Also, not all the models are water-resistant. You have to check the specifications of a particular model before buying. Hoverboarding has become quite popular among kids. These machines are readily available online from countless brands. The ones that we have suggested above are secure and gives you the full value of money. You can pick any model from above and will never have to regret the purchase. Happy Shopping!